For drop-shippers, We blind ship your purchases directly to your customers. Please use the contact form below to upgrade your checkout process. If you purchase large quantities, we can set account to automatically discount alll of your purchases. Please use the contact form below to inquire about upgrading your account. 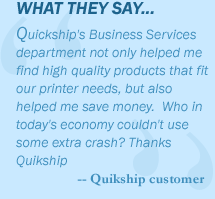 If you are government or school Quikship Toner offers many select programs to service your specific needs. We offer educational discounts plus much more. Do you supply other business with your products? Let us help you save further costs by becoming a B2B account holder.